We were in Italy for the last few weeks. One of the things we did while there was to spend a few days at a lovely agriturismo in Tuscan. 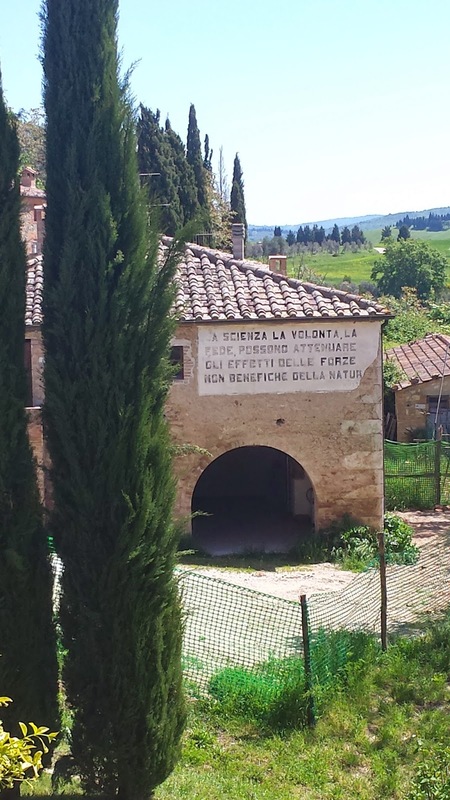 On one of our walks, to the small village of Lucignano d'Asso, we came across this old barn still sporting a legend from the days of Mussolini. This is a statement of faith; with science, faith, and the will to do so, we will conquer nature. This was part of the modernist time in history (we may still be in it), in which the idea of determined rationalism can improve our lot, as a replacement for blind religious-type faith. Also part of that, and in line with Hitler, Mussolini was a believer in racial supremacy, of Italians and the Aryan 'race'. This was more stridently evil at that time and place, but indeed in post-Darwinian science more generally, the belief was (is) that our essence (and our value) was built into our genes. Society, being modern and hence rationale, could use science to alter nature at will, to make life better (at least, for the alterers in power). This belief was held even though specific genes were not even identifiable at the time. 1. Human races exist. This is obvious simply by observation. Racial characteristics are inherited, but the existence of races doesn't necessarily imply the superiority of any. 2. There exist large races (white or black) and small races ( i.e. Nordic or Mediterranean). Biologically, the smaller groups constitute the real races; this is just obvious. 3. The concept of race is a purely biological concept. The Italians are different from the French, the Germans, the Turks, the Greeks, etc., not only because each has a different language and a different history, but because of different racial constitutions of these people. 4. The majority of the population of contemporary Italy is Aryan in origin and its civilization is Aryan. 5. The influx of huge masses of men in historical times is a legend. For the most part, the racial composition of today is what it has been for thousands of years. 6. There exists by now a pure "Italian race”, based on the ancient purity of Italian blood. 7. It is time that the Italians proclaim themselves frankly racist. The question of racism in Italy ought to be treated from a purely biological point of view, without philosophic or religious intentions. This implies a great responsibility on the part of Italians. 8. It is necessary to make a clear distinction between the European (Western) Mediterranean races on one side and the Eastern [Mediterranean] and Africans, and Semitic and North African on the other. That is, Italians aren't African. 9. Jews do not belong to the Italian race and represent the only race that has never assimilated. 10. The purely European character of the Italians ought not to be altered in any way. This was the foundation for the race laws that were enacted over the next five years in Italy, including stripping Jews of Italian citizenship and from positions in the government and many other professions, prohibiting Jews from employing Aryans, and so forth. Italy had never been particularly anti-Semitic before this, but during World War II 10,000 Italy sent Jews to Auschwitz, 8,000 of whom were killed. Mussolini was said to have boasted to his mistress in 1938, with respect to the notion that he learned his racism from Hitler, that he was a racist even before Hitler was born (odd that though, since he was only 6 years older than Hitler). "I have been a racist since 1921. I don't know how they can think I'm imitating Hitler," Mussolini is quoted as boasting in August 1938. "We must give Italians a sense of race." The idea was, of course, that some people are better than others. The 'others' included those with inherent diseases that made them a burden on the better parts of society, or whose genes made them undesirable, such as by making them criminals, prostitutes, druggies, and so on -- as opposed to noble officials in our societies. But it was not just the odd psychotic or gypsy here and there who were the burden, it was the societal load of the inferior groups, that is, less desirable races. The classificatory approach: truth, approximation, or illusion? The expression of such beliefs was strident at the time, but the tenor is eerily current. The idea (belief, fact -- even the choice of word here belies ideological underpinnings) that we can delimit races with genetics, that races are biologically definable categories, is very much with us again: it is again tolerable, if not in some quarters downright fashionable, to make such assertions. It's even entrenched in the way that many apply the statistical methods that human geneticists often use to classify populations. When a computer program (e.g., STRUCTURE) tells us there are 5 human races, why shouldn't we believe it? Ken and Jeff Long wrote about this in a paper in Genome Research in 2009 ("Non-Darwinian estimation: My ancestors, my genes' ancestors"). The idea -- and it goes back very clearly to the eugenics era -- is that there are specific categories of humans (call them 'races' or, if you want to be politically correct, call them 'geographic populations') that exist, such that everyone is either a member of such a category or has admixed ancestry among them. Ken has written several other papers on this subject (e.g., 'Racing around, getting nowhere', Evol. Anthropol., 14: 165, 2005). The point in essence is that these admixture-based approaches assume 'pure' populations to actually exist now, or in the recent enough past. The methods themselves can find such categories, and essentially define them in a statistical way. That is, the methods can 'find' such groups even if they don't exist historically; this is an important point. The authors of STRUCTURE and similar programs do not use them for racist purposes and include all the requisite disclaimers; but the use by many prominent investigators, and their interpretation by those for whom it is convenient, is as we discuss in this post. It is obvious even to the most racist racist that not everybody in a given race is identical (despite the common unstated implication that they all may have some group-specific value, such as being more intelligent, athletic, musical, etc. than some other group). But if a group is sealed off from other groups, and its members mate at random within the group, even if the very same variants are found, but at different frequencies, in other groups, the genetic profile (the frequency of variants at a set of measured genes, or in the whole genomes) of the group can be characterized statistically. Then, if members of different groups move somewhere and mate, their offspring will be statistically seen to be a genetic mix, an admixture, of the two parental groups. Leaving aside the technical details, if you take some samples from different places in the world and assume this admixture scenario, then your statistical program can find the parental and admixed groups, and estimate each person's admixture percentages. But this will happen even if there are not and never were distinct sealed-off groups; that is, the analysis takes your assumptions and gives you a best answer to the nature of the groups. Genomes are connected by history, so of course you are like your parents, and someone from another continent will resemble his/her parents (here we assume no long-range migration). Extending this over history and space, you expect to find genomic differences across the continents. But human history is such that populations have not generally been isolated so that they reflect the assumptions of admixture analysis, except in the very approximate way that your analysis simply reflects the differences that gradually accumulate with geographic distance. People differ everywhere, and the differences are everywhere in the genome. But our species is not evolved as packages sealed from other packages. This is easy to see by computer simulation. If you assume no packaging into discrete categories in the actual historical generation of human variation, but analyze samples of populations assuming that they do represent discrete populations and their admixed progeny, the analysis will give you an answer that is strictly the product of your assumptions and contrary to the actual history. Ken and Brian Lambert showed this in a recent article ('What type of person are you? Old-fashioned thinking even in modern science', Cold Spring Harbor Perspectives in Biology). This reflects the problem with racial thinking that looks for differences (and, so often, differences in traits with societal value, like intelligence or criminality or political leanings). Of course, because we evolved across wide time and space ranges, it is comparably wrong to assume or assert that there are no important geographically distributed differences. Unfortunately, people looking at this subject take polarized stances about it. Perhaps we will opine on the subject of race itself in some future posts, in a way that lays out the issues rather than taking a political stance (or using selective citation to take a non-PC racist view to get attention or sell books). Part of the problem with the discussion of 'race' and many similar kinds of subjects that science can address in principle is that we become polarized, taking emotionally held belief systems that may (as in the case of 'race') take on and reflect inherently social or political positions. The truth of climate change, or of evolution are other such areas. This is different from arguments among scientists about such detached subjects as the existence of life-bearing planets, or the evolution of 5-toed animals from earlier precursors. There can be strongly held debates about these things, but societal politics are not at issue. There is a very fine book by John Moore called Science as a Way of Knowing (Harvard Press, 1993), written by biologists who wanted to teach teachers how to teach what science is, by taking the evolution of biology from its classical origins to the present (of the 1990s). The books is now a bit dated, but still it uses biology to lay out the way of thinking that is science, not as a way to the one and only truth, but as a method of approach to thinking about Nature. The belief that if science says it, it must be true didn't disappear with the end of fascism, of course. For many, science has taken over from philosophy and religion as the source of truth in a material world. Beliefs such as that with science we can avoid the disastrous effects of climate change or over-population or food insecurity or the end of fossil fuels, or that science will soon keep us alive for hundreds of years if not forever, are widespread. They are based on assumptions about the nature of truth, about causation, and so on, but just as much about who is accepted as the authority figure when dealing with human problems. As our son-in-law -- an Italian musician, philosopher, and historian -- said one day, as we were discussing these issues, "The biggest taboo is the absurd, because science has made it so." Those of us who don't find our truths in religion tend to believe that science can and will make sense of the universe, from the subatomic to the cosmological. And we assume that objectivity is possible and that there are singular objective truths to be discovered, that the cosmos is unitary in its material causation. The cosmos could be unitary but even if it is, we forget that what we as humans take from science is based to a great extent on what we put in -- our assumptions, beliefs, chosen methods and ways of approach, and the questions we ask and how we frame them. These are often very largely subjective rather than objective aspects of science. Historians of science have clearly shown this to be true, regardless of the degree to which the underlying assumptions about the cosmos are correct. We come to science with assumptions about how the world is -- the sun revolves around the earth, we can understand diseases by understanding single genes, or ideas about how humans should be classified -- and our assumptions define and color our results. Human biological diversity, i.e. the biological reality of race, is very real. This entire Cultural Marxist line that "race is a social construct" is not only tiresome, it's a lie and a lie that needs to be crushed. Yea, I don't like racism. (I'm Chinese-American) But discussing biological is something entirely different. As HBD Chick recently pointed out, mass genocide was occurring long before (and to a much greater extent than since) our knowledge of race. Here's my new rule: Any article discussing race that mentions 'Hitler' should from this point forward automatically be disqualified. It's a silly scare tactic and dishonest. Here's my new rule: anyone that comments on my posts anonymously, and without actually reading what I've written shouldn't be taken seriously. Hitler and his era deserve mention because they are the icons that represent what rabid junk science can lead to when applied to society by the powerful. Most of us, even I think most racists (are you one?) would agree that racist policy and discrimination is not good for society. Of course it is true that science is only one of the recent excuses for rapine imperialism and social discrimination, and even if its claims about genetic determinism were accurate, that would not justify policy changes that were discriminatory in a punitive way. And of course human predation on other humans, of various sorts, goes back way to the beginning of history. But any excuse that can incite racism is one that should, in my view, be resisted, and if based on very weak science, even more so. You claim to be against racism, and cite being Chinese-American in support of that. I wonder what you would say if you were in the US in the late 1800s, when Chinese were imported in large numbers to work essentially as serfs on projects like building railroads, and our culture basically viewed them as too inherently stupid to do much else. Today, Chinese is not a damaging thing to be, relative to other US ethnic minorities, so you're safe to say things as you did. Because the racists today think you guys are even smarter than us whites! It is true that a problem is that the politically-correct view (that there are no group differences) is scientifically incorrect, a kind of denial in many ways a mirror image of the excesses of racial determinism by geneticists these days. Unfortunately, serious discussion of the issues is not possible (as we noted in our post), because people are polarized, and these are deeply emotional issues. 'Hitler', again as an iconic representation, is one of the reasons. In the long eugenic era, the leading scientists, not weaklings who couldn't get tenure, were proponents of discriminatory racism based on value judgements that those in power placed on others-- basically as excuses for political struggles. As Anne says, it is interesting that to date, over several years, the preponderance of HBDers who have left comments have done so under cover of anonymity Of course, you all may trash us under your names when writing for your own club. But if your view is right, why not proclaim it openly. Why not, in your next lab meeting, say that to your peers in whatever graduate program you're in? Or to your supervisor? Tell him or her that you want to do your dissertation to show that some race (say, Chinese) are genetically smarter than others, or that some (say, well, you can pick your favorite, even perhaps some minority ethnic group in China) are inferior. And say that you want your dissertation to be used in making policy, such as, say, depriving them of educational resources, or perhaps following them preventively because they're inherent criminals. I say this not to start an argument, because I won't respond any further, and because It is not clear what you mean when you say everything else that you say or imply, and yet say you "don't like racism". Again, if this were about something without human consequences, and were based on actual solid science rather than loose speculation, nobody would care. I would finish by saying that in my personal view, even if all the science were proper and valid, we still would not want as a society to cause the turmoil, and plain misery, that racist policies impose--unless, of course, you think things like slavery based on genetics is a good idea. If you don't think that, why the persistent stress (that, yes, goes back to the eugenics era) on the subject of genes related to societal values, like intelligence, sexual performance, and so on? "But if your view is right, why not proclaim it openly. Why not, in your next lab meeting, say that to your peers in whatever graduate program you're in?" Don't be silly. You know as well as I that political correctness is rampant in USA and we could lose positions and grants. I do hope, though, for the day when can talk about these ideas openly with our real names. Thanks both of you for your responses. I just get really tired of political correctness and its silly lies. The problem is that people who don't like political correctness tend to be racist--first in a rather 'innocent' sense of saying that 'races' exist as entities and then focusing on socially sensitive traits. I wonder why. Being covert about your views is just as objectionable as being politically correct. If your views can withstand the light of clear, unemotional, and unpolitical analysis, or if there is to be a real sense of discussion of these important issues, then it has to be out in the open. Of course, if perhaps you're afraid that your views wouldn't actually stand the light of day, then it's better to stay hidden. But is covert assertion of beliefs consistent with science? The errors of political correctness are easy to see. But there is a good reason for those errors, and that's where reference to eugenics become legitimate, because eugenics started out as supposedly innocent and benevolent as a lot of this stuff, that is re-emerging, does today. So, from a PC point of view, better keep this stuff from being done or said, than risk the consequences. Horrors of that type haven't been visited on the racist point of view....well, I guess the crushing of the Axis in the war was a kind of payment to them for their views. Many otherwise innocent racists perished. There is no denying the horrors that happened, and have happened, in the name of Darwin and natural selection and evolution, and that is the _political_ defense of PC-ness. After all, there are many questions about life that one can ask and address--why the urge to pick on the race question, given its history? What is to be gained from the science, assuming it were done right, and indeed that in complex human societies that it even could be done right?